Symposium "Multiphasic approaches to elucidate face perception"
Abstract: Visual illusion or optical illusion includes geometrical illusion, color illusion, brightness/lightness illusion, motion illusion, visual completion, trompe l’oeil, etc. 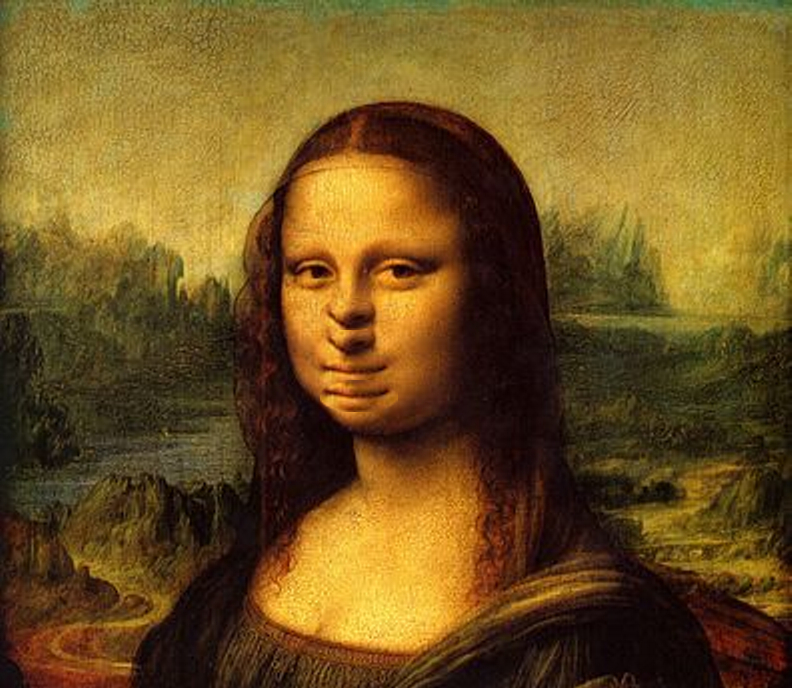 Here I introduce a new category "face illusion" and demonstrate a variety of facial phenomena that should be listed in this category. Q1. 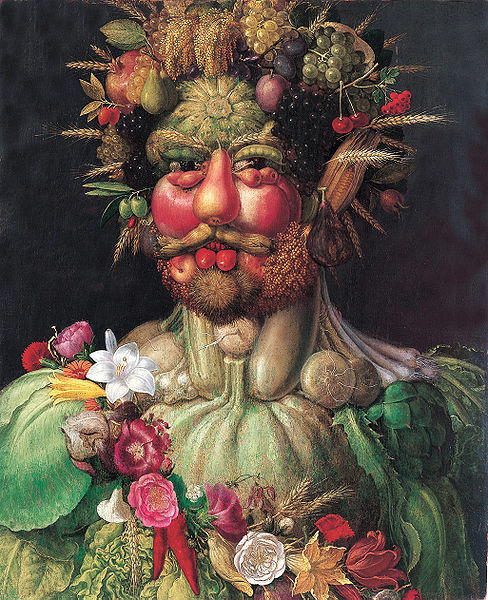 Is the effect of Giuseppe Arcimboldo's artworks the face illusion? Q2. 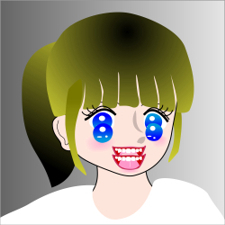 Is the effect of Henohenomoheji (Japanese traditional face picture made of Japanese letters) the face illusion? 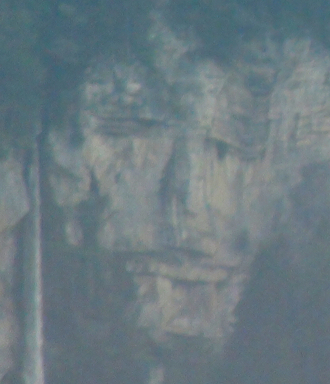 How about the hollow face illusion? 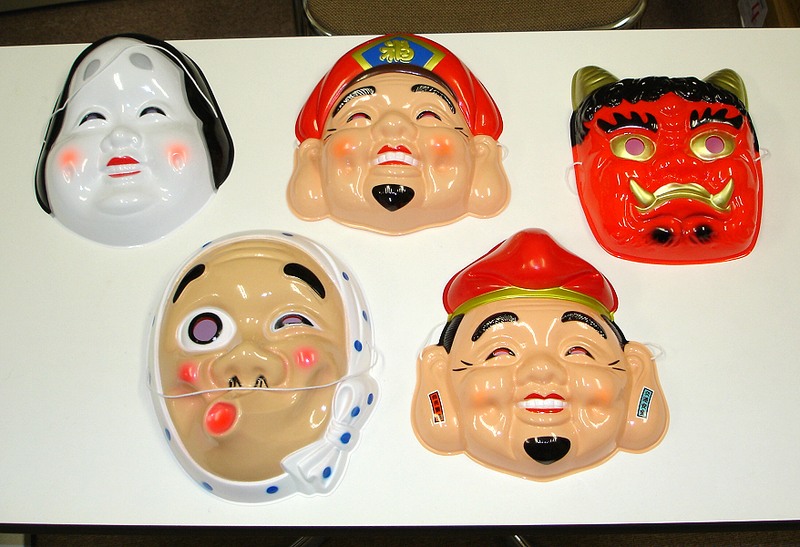 Masks popular in Japan. To buy them, click. Color assimilation makes pale face better. 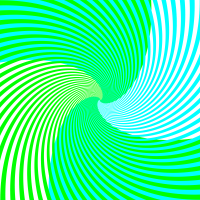 This is a color illusion (color assimilation). "Japan-style My Wife and My Mother-in-Law"
A young lady is reversible to an old lady. This is an ambiguous image. 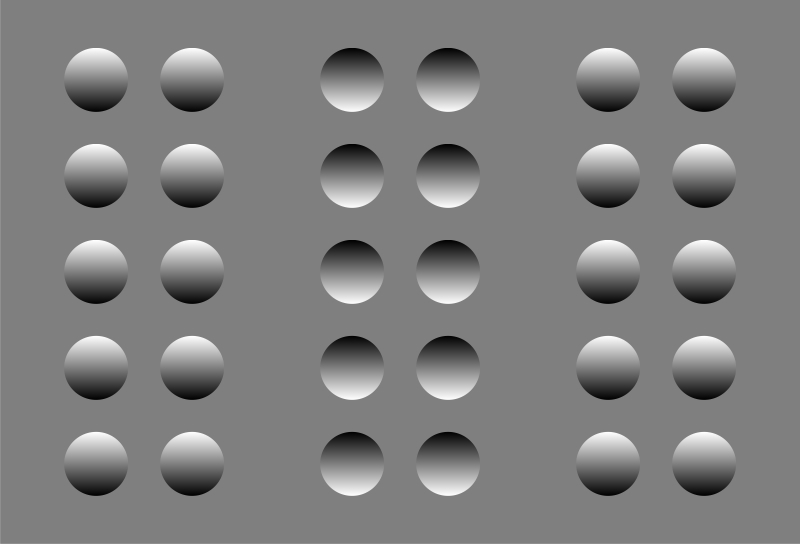 The face appears to move according to retinal slips. 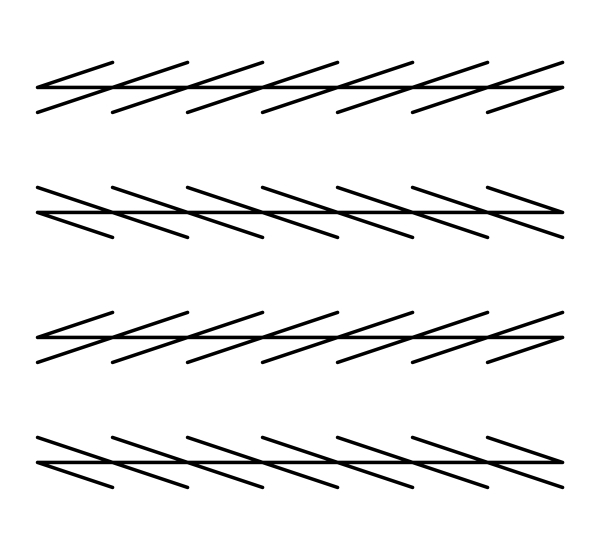 This is the spine drift illusion. 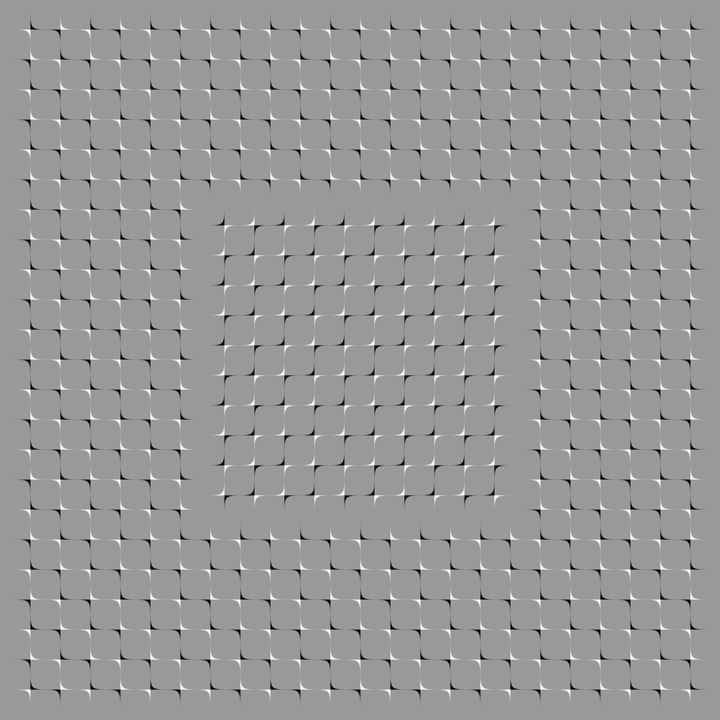 This is a motion illusion. 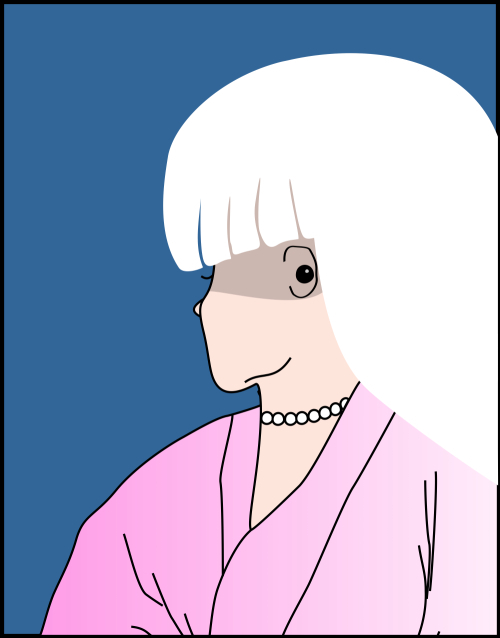 Eyes appear to tilt in the direction opposite to the tilts of eyebrows. This is a geometrical illusion (Zöllner illusion). How about the Thatcher illusion? 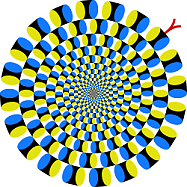 "An illustration of the Thatcher illusion"
Arnheim, R. (1954) Art and visual perception: A psychology of the eye. Berkeley: University of California Press. Bartlett, J. C. and Searcy, J. (1993) Inversion and configuration of faces. Cognitive Psychology, 25, 281-316. Bertin, E. and Bhatt, R. S. (2004) The Thatcher illusion and face processing in infancy. Developmental Science, 7, 431?436. Boutsen, L. and Humphreys, G. W. (2002) Face context interferes with local part processing in a prosopagnosic patient. Neuropsychologia, 40, 2305-2313. Boutsen, L. and Humphreys, G. W. (2003) The effect of inversion on the encoding of normal and "thatcherized" faces. Quarterly Journal of Experimental Psychology A, 56, 955-975. Boutsen, L., Humphreys, G. W., Praamstra, P., and Warbrick T. (2006) Comparing neural correlates of configural processing in faces and objects: an ERP study of the Thatcher illusion. Neuroimage, 32, 352-367. Carbon, C. C., Schweinberger, S. R., Kaufmann, J. M., and Leder H. (2005) The Thatcher illusion seen by the brain: an event-related brain potentials study. Cognitive Brain Research, 24, 544-555. Carey, S. and Diamond, R. (1977) From piecemeal to configurational representation of faces. Science, 195 (4275), 312-314. Diamond, R. and Carey, S. (1986) Why faces are and are not special: An effect of expertise. Journal of Experimental Psychology: General, 115, 107-117. Edmonds, A. J. and Lewis, M. B. (2007) The effect of rotation on configural encoding in a face-matching task. Perception, 36, 446-460. Ellis, H. D. (1975) Recognising faces. British Journal of Psychology, 66, 409-426. Farah, M. J., Tanaka, J. W., and Drain, H. M. (1995) What causes the face inversion effect? Journal of Experimental Psychology: Human Perception and Performance, 21, 628-634. 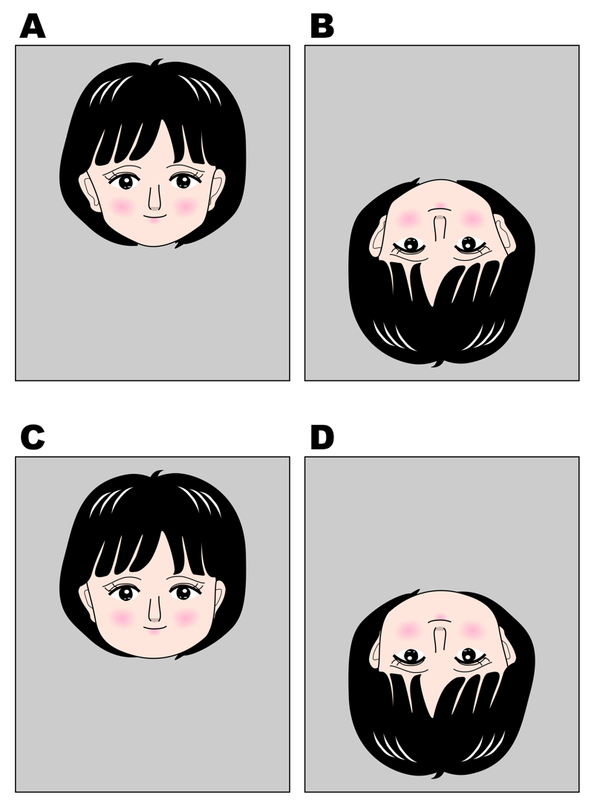 Goldstein, A. G. (1965) Learning of inverted and normally oriented faces in children and adults. Psychonomic Science, 3, 447-448. 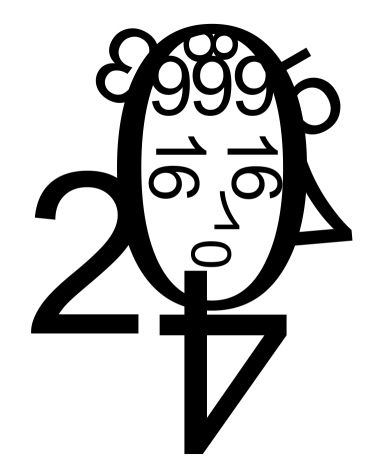 Leder, H., Candrian, G., Huber, O., and Bruce, V. (2001) Configural features in the context of upright and inverted faces. Perception, 30, 73-83. Lewis, M. B. (2001) The Lady's not for turning: Rotation of the Thatcher illusion. Perception, 30, 769-774. Lewis, M. B. (2003) Thatcher's children: Development and the Thatcher illusion. Perception, 32, 1415-1421. Lewis, M. B. and Johnston, R. A. (1997) The Thatcher illusion as a test of configural disruption. Perception, 26, 225-227. Lobmaier, J. S. and Mast, F. W. (2007) The Thatcher illusion: Rotating the viewer instead of the picture. Perception, 36, 537-546. 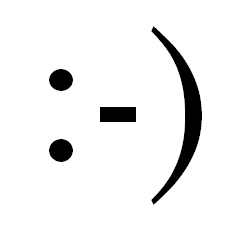 Milivojevic, B., Clapp, W. C., Johnson, B. W., and Corballis, M. C. (2003) Turn that frown upside down: ERP effects of thatcherization of misorientated faces. Psychophysiology, 40, 967-978. 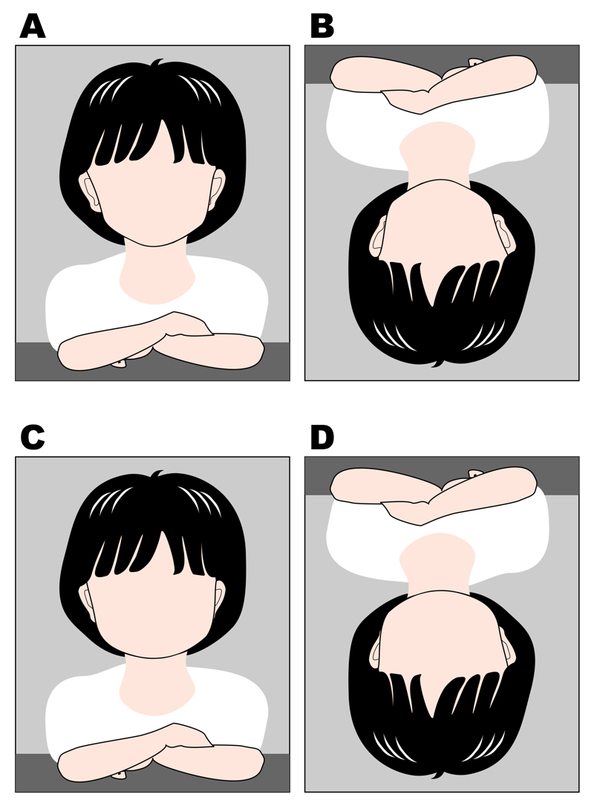 Murray, J. E., Yong, E., and Rhodes, G. (2000) Revisiting the perception of upside-down faces. Psychological Science, 11, 492?496. Parks, T. E. (1983) Letters to the Editor. Perception, 12, 88. Parks, T. E., Coss, R. G., and Coss, C. S. (1985) Thatcher and the Cheshire cat: context and the processing of facial features. Perception, 14, 747-754. Rakover, S. S. (1999) Thompson's Margaret Thatcher illusion: when inversion fails. Perception, 28, 1227-1230. Rakover, S. S. and Teucher, B. (1997) Facial inversion effects: parts and whole relationship. Perception & Psychophysics, 59, 752-761. Rhodes, G. and Jeffery, L. (2009) The Thatcher illusion: Now you see it, now you don't. Perception, 38, 927-929. Rhodes, G., Brake, S., and Atkinson, A. P. (1993) What's lost in inverted faces? Cognition, 47, 25-57. Rock, I. (1974) The perception of disoriented figures. Scientific American, 230, 78-85. Rock, I. (1988) On Thompson's inverted-face phenomenon (Research Note). Perception, 17, 815-817. Rouse, H., Donnelly, N., Hadwin, J. A., and Brown, T. (2004) Do children with autism perceive second-order relational features? The case of the Thatcher illusion. Journal of Child Psychology and Psychiatry, 45, 1246?1257. Sjoberg, W. and Windes, J. (1992) Recognition times for rotated normal and "Thatcher" faces. Perceptual and Motor Skills, 75, 1176-1178. Sturzel, F. and Spillmann, L. (2000) Thatcher illusion: Dependence on angle of rotation. Perception, 29, 937-942. Talati, Z., Rhodes, G., and Jeffery, L. (2010) Now you see it, now you don't: Shedding light on the Thatcher illusion. Psychological Science, 21, 219-221. Tanaka, J. W. and Farah, M. J. 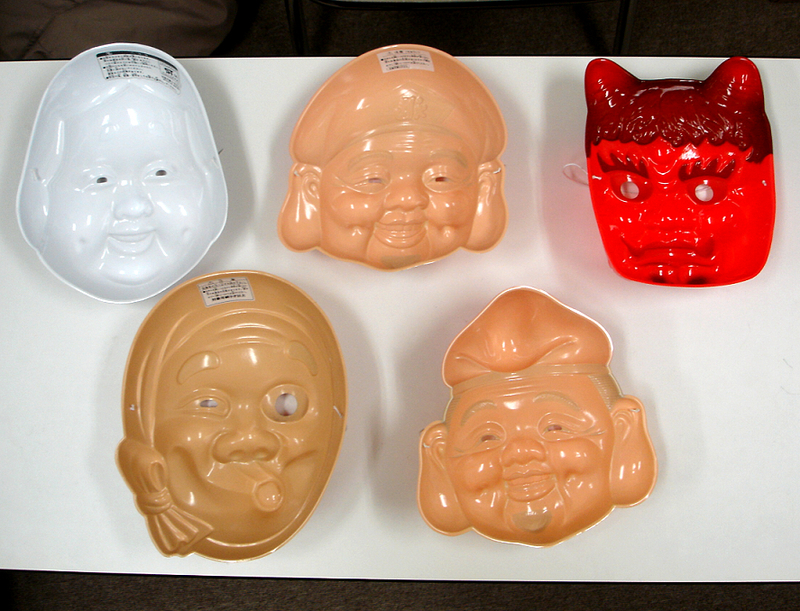 (1993) Parts and wholes in face recognition. Quarterly Journal of Experimental Psychology A., 46, 225-245. Thompson, P. (1980) Margaret Thatcher: a new illusion. Perception, 9, 483-484. Valentine, T. (1988) Upside-down faces: A review of the effect of inversion upon face recognition. British Journal of Psychology, 79, 471-491. Valentine, T. and Bruce, V. (1988) What's up? The Margaret Thatcher illusion revisited. Perception, 14, 515-516. Yin, R. K. (1969) Looking at upside-down faces. Journal of Experimental Psychology, 81, 141-145. 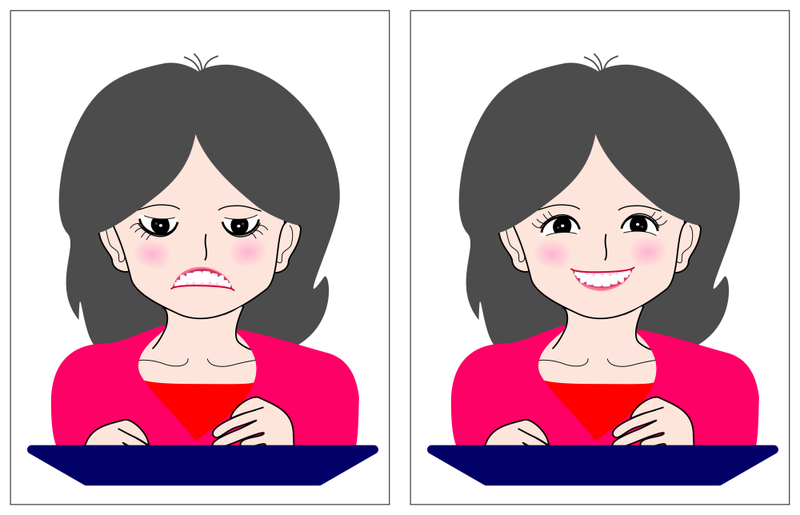 "An illustration of the Valentine-Bruce effect"
If the positions of eyes and the mouth are interchanged, the face appears to be funny as shown in the middle panel. 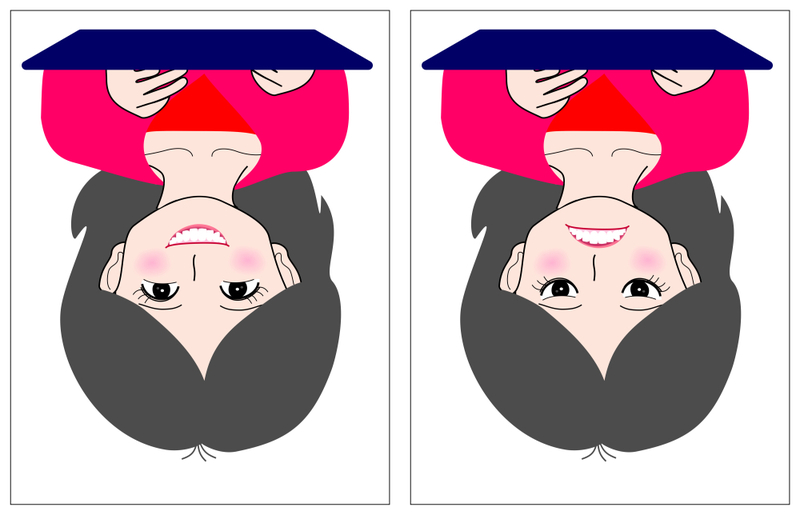 When this funny face is rotated upside-down, it appears to be funny with a different impression as shown in the right panel. Demonstrating this effect, Valentine and Bruce (1985) argued against Parks (1983) who claimed the importance of the contour of a face as the frame of reference in the Thatcher illusion in which the upright face works better as the frame of reference than the inverted one. Valentine, T. and Bruce, V. (1985) What's up? The Margaret Thatcher illusion revisited. Perception, 14, 515-516. In the Thatcher illusion as shown in the lower image, only the face shown in the middle panel appears to be funny. 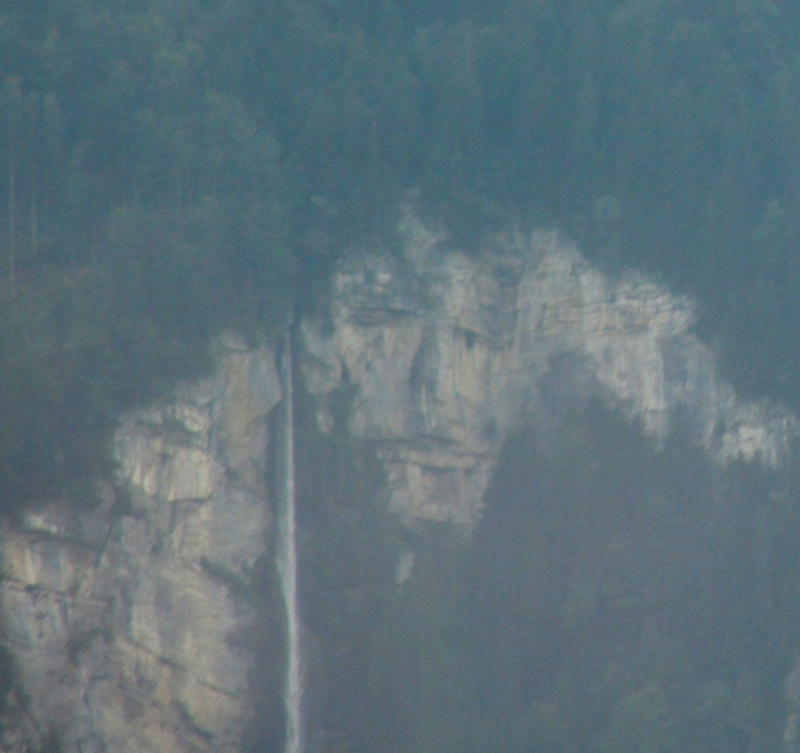 The lower face appears to be larger than the upper one though they are identical in size. 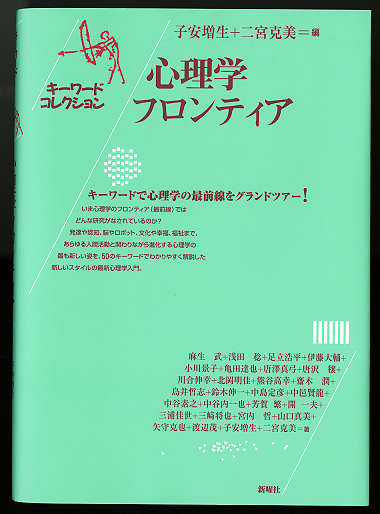 "Akiyoshi's analyses of the fat face thin illusion: 1. Reproduction in CG"
The fat face thin illusion was proposed by Dr. Peter Thompson in the 6th Annual Best Illusion of the Year Contest in 2010. I has reproduced this illusion in CG. (A) is the original. (B) is the inverted image of (A). 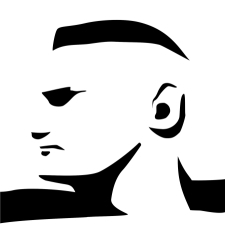 The face in (B) appears to be slimmer than that in (A). (C) shows a fat-face version. 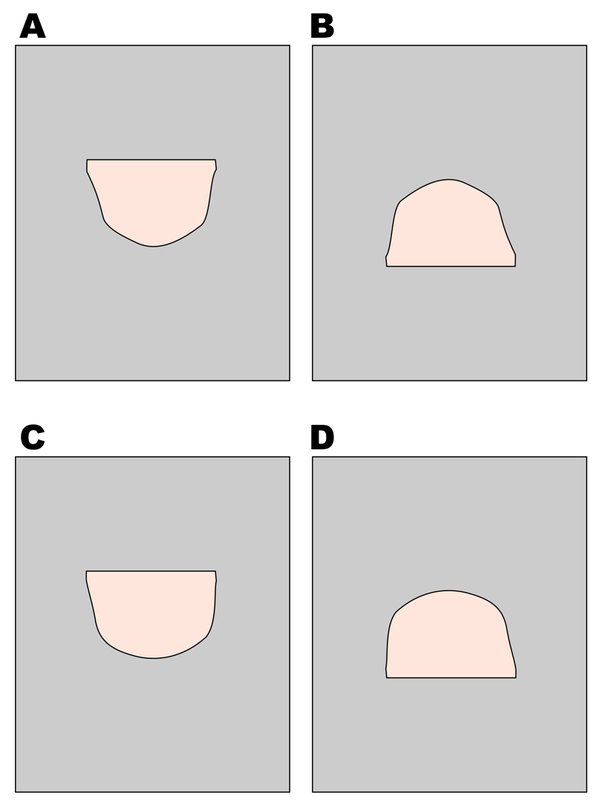 (D) is the inverted image, which shows a much slimmer face than (C). Thus, reproduction in CG has succeeded. 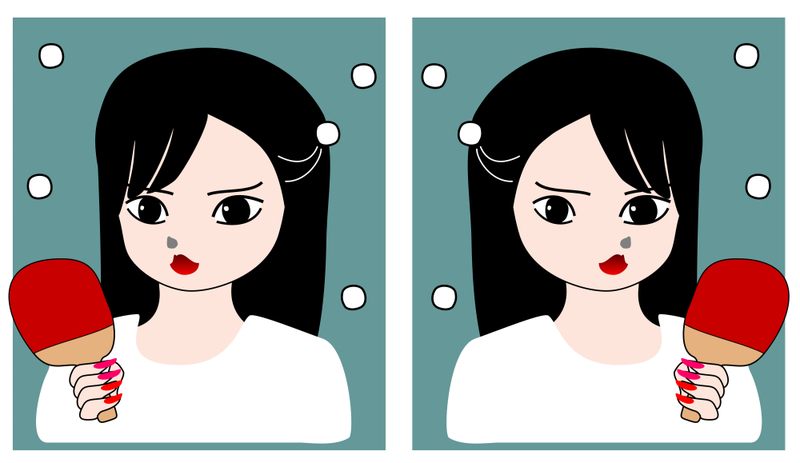 "Akiyoshi's analyses of the fat face thin illusion: 2. 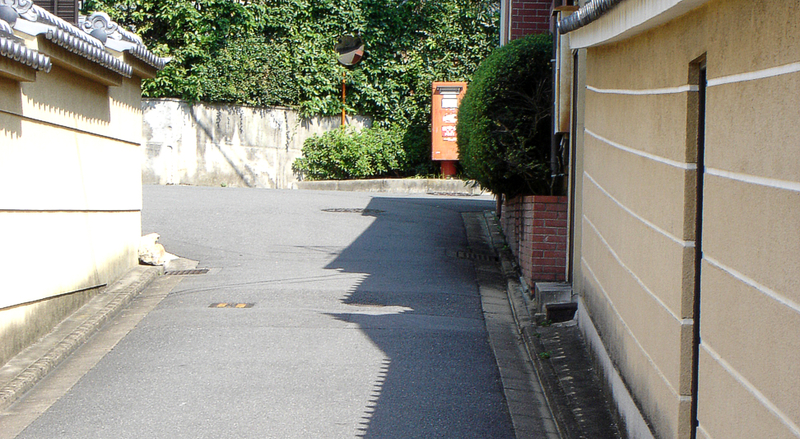 Effects of shade and shadow"
I have removed shade and shadow. 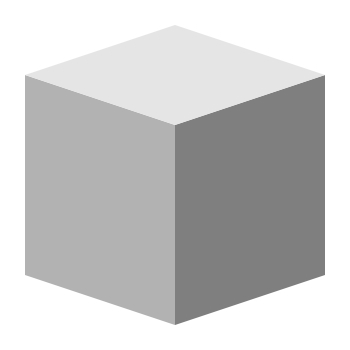 The fat face thin illusion remains, though shade and shadow appear to contribute to this illusion to some extent. 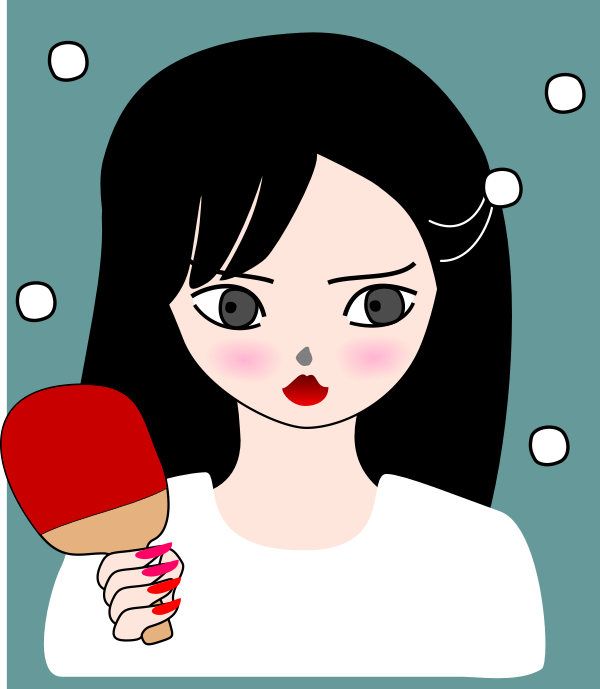 "Akiyoshi's analyses of the fat face thin illusion: 3. Effects of facial parts"
I have removed eyes, mouth, nose and eyebrows. The fat face thin illusion remains. 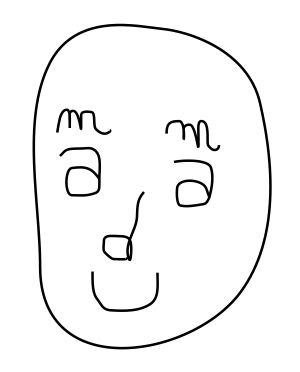 Thus, the facial contour alone can generate this illusion. 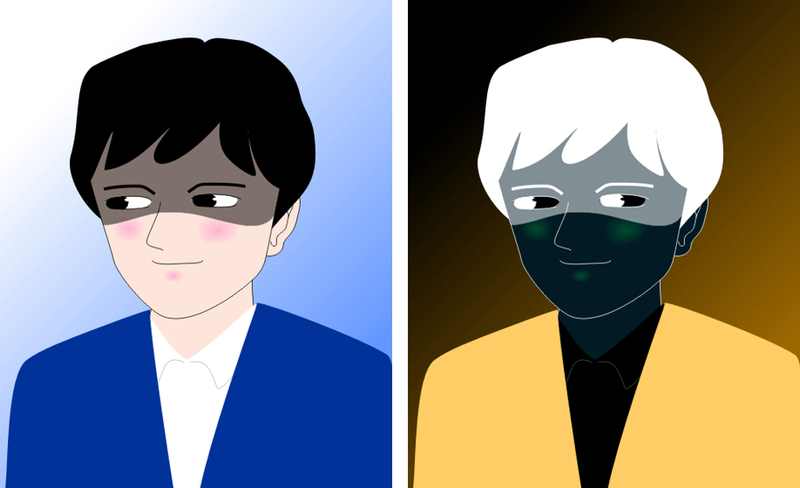 "Akiyoshi's analyses of the fat face thin illusion: 4. Effects of cues other than face"
I have removed the background. The fat face thin illusion remains. Thus, face alone can generate this illusion. 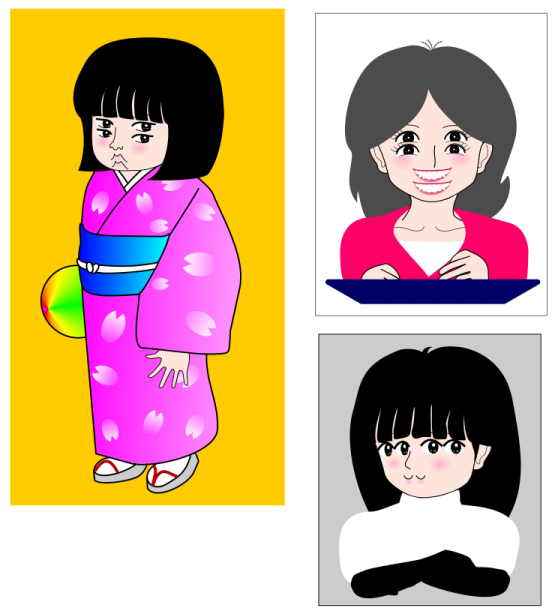 "Akiyoshi's analyses of the fat face thin illusion: 5. Upside-down faces"
I have tried upside-down faces. 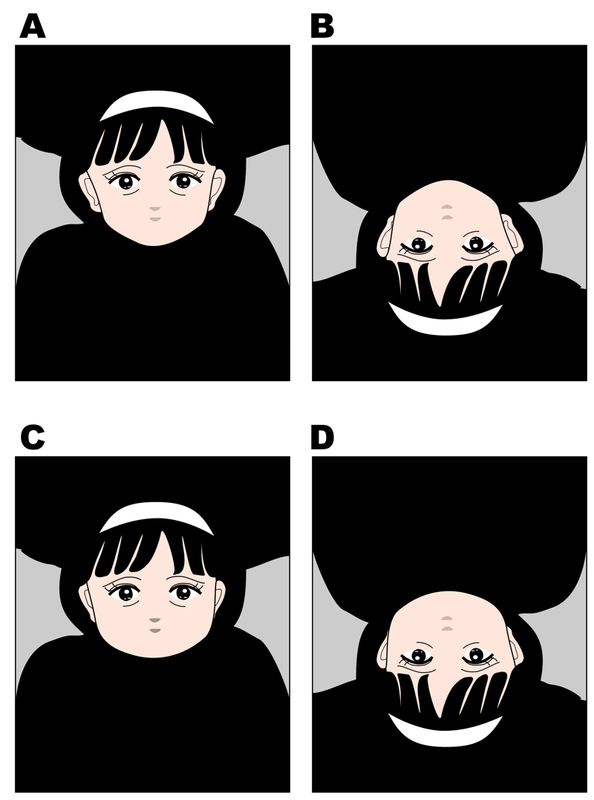 The fat face thin illusion remains even when the upside-down face (each right image) is conscious. 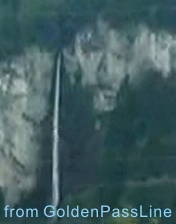 This finding raises a question whether this is a face-specific illusion. 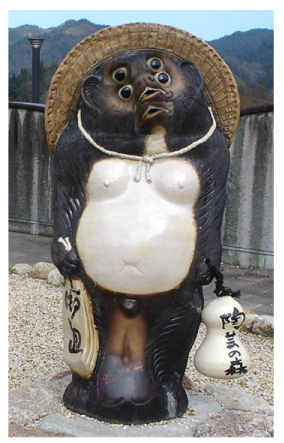 "Akiyoshi's analyses of the fat face thin illusion: 6. Is it a mere geometrical illusion?" 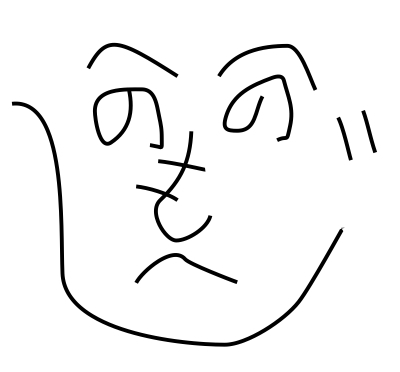 I have simplified the face to a shape like half circle. 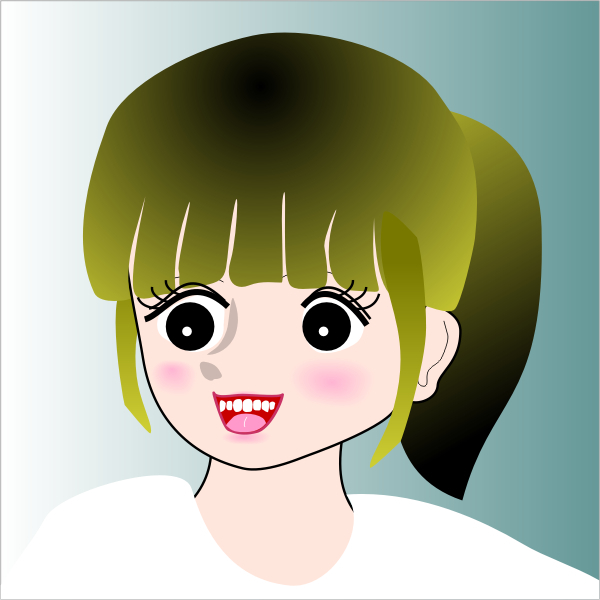 For me, the fat face thin illusion almost disappears. 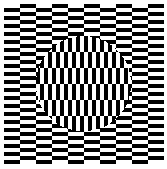 This finding suggests that this illusion is not a simple geometrical illusion. 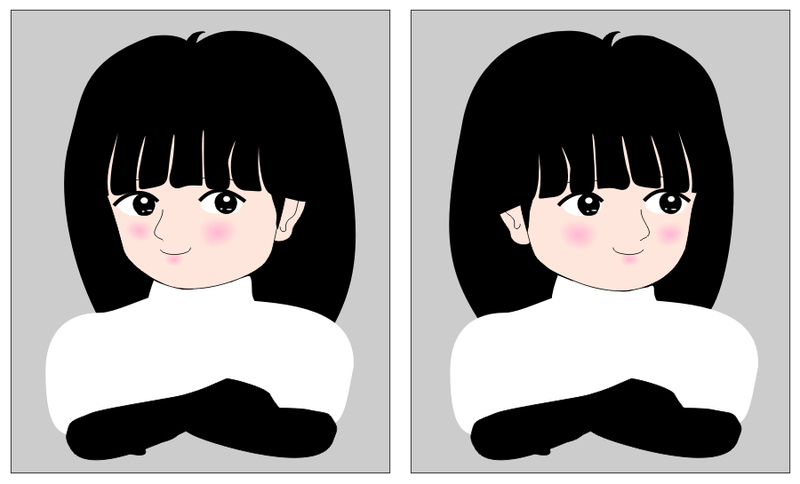 "Shepard illusion with a face"
The right face appears to get compressed in the up-down direction as compared with the left one, though they are the same image (the same size and shape). This apparent difference depends on the Shepard illusion, one of the most striking geometrical illusions. The Shepard illusion refers to the apparent difference in shape or size between the left and right parallelograms (physically the same shape or size) on that the faces are drawn. Shepard, R. N. (1990) Mind sights: original visual illusions, ambiguities, and other anomalies, with a commentary on the play of mind in perception and art. New York: Freeman. 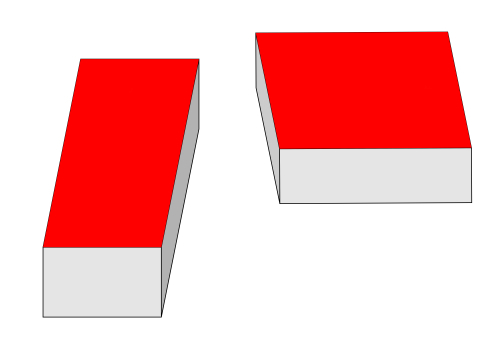 In the left image, the square contour appears to be elongated along the vertical axis of a face. WANTED for the related paper I ever encountered and missed! 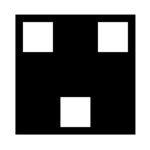 The square contour appears to be elongated along the vertical axis of a face. "Overestimation of the farther eye"
The left eye appears to larger than the right one, though they are the same size. The right eye appears to larger than the left one, though they are the same size. These eyes are the same as those in the image above. 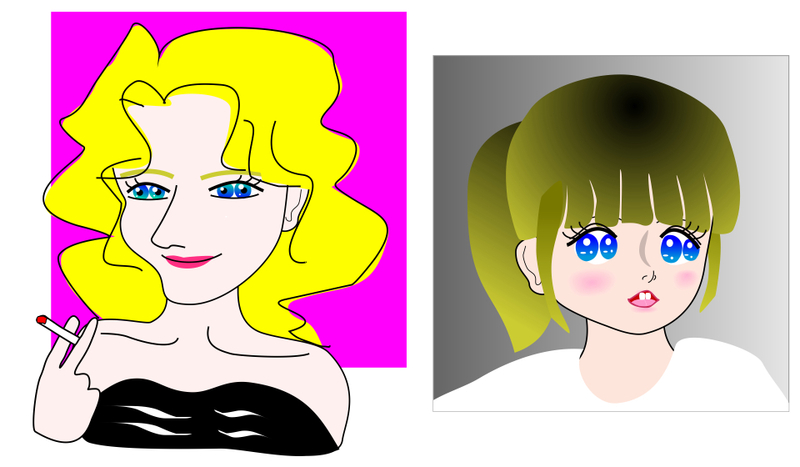 The eyes of the right image are the same as those of the left one, but the proportion between the eyes in the right image appears to be funny. 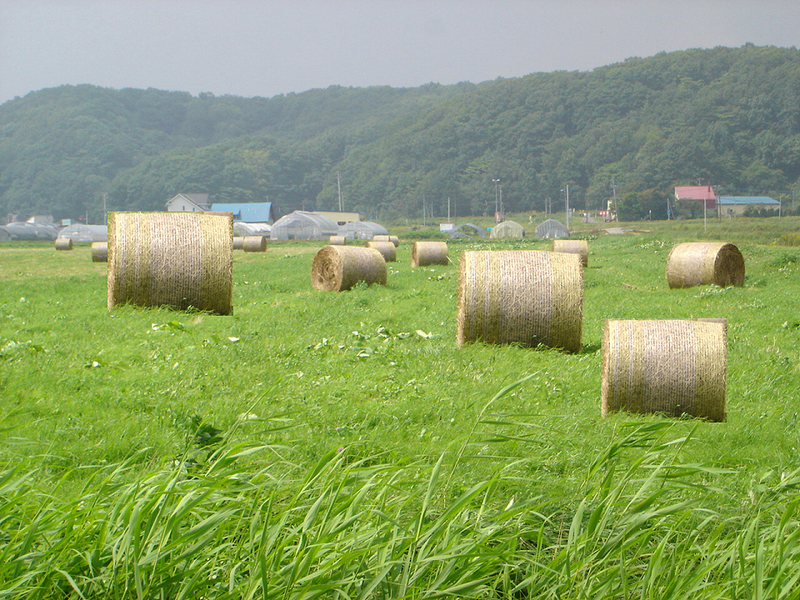 The three hay rolls project the same retinal size, but the leftmost one appears to be the largest and the rightmost one the smallest. How about the "illusion of eye directions"? 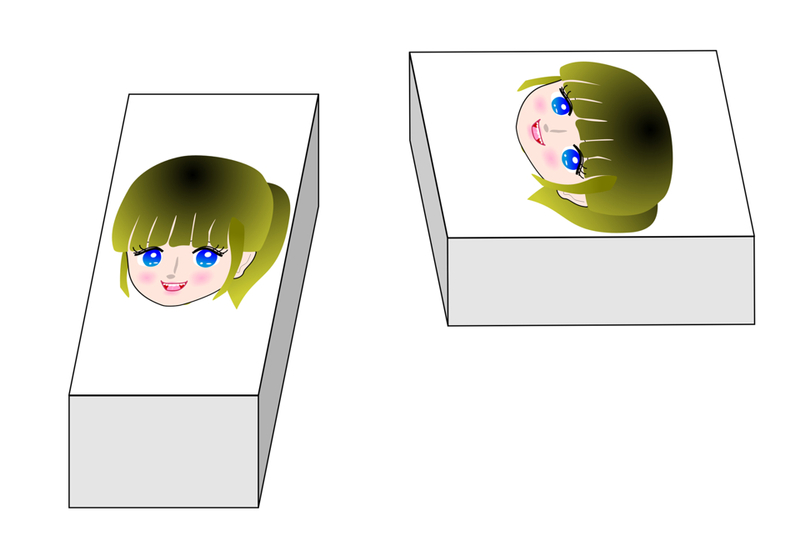 The left face appears to gaze at the observer while the right one appears to see leftward (for her), though the eyes are identical between them. This phenomenon was proposed by Wollaston (1824). "An illustration of the bloodshot illusion"
The luminance-induced gaze shift or the bloodshot illusion (Ando, 2002). 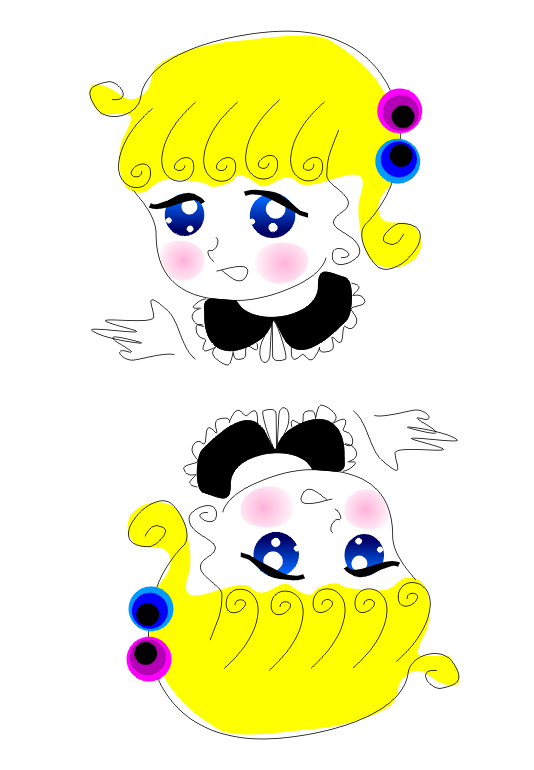 Although the position of the iris and pupil in each eye's contour is the same among the three images, the apparent direction of gaze is shifted to the darkening part of the sclera (the white of the eye). Ando, S. (2002). Luminance-induced shift in the apparent direction of gaze. Perception, 31, 657-674. Sinha, P. (2000). Here's looking at you, kid. (The perception of gaze direction) Perception, 29, 1005-1008. "Bogart illusion in a drawing"
The left man appears to gaze rightward, while the left man, just the negative image of the right, appears to see toward us. Although the position of the iris in each eye's contour is the same among the three images, the apparent direction of gaze tends to be shifted to the positional bias of the pupil. 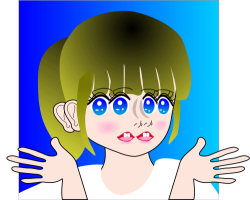 She appears to see either rightward or leftward. When observers see this image at a distance or when those who wear glasses take off them and see this image, the direction appears to be leftward (for her). How about the "doubled-parts unstable illusion"? One of my students reported that he had come across a web site that exhibits a number of pictures of the "knocked-face" illusion as examples of "double vision". Double vision or diplopia is a disease that patients see a single thing double. 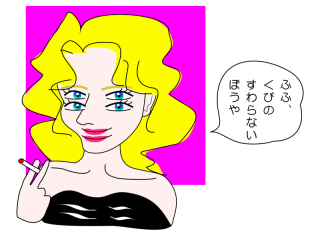 However, I believe that this illusion should not be called "double vision" because visual illusion is not a disease. It would be OK if this illusion was called "the illusion of double vision" for example. 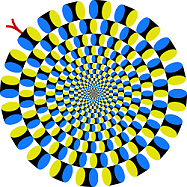 This illusion is a new type of anomalous motion illusions such as the Ouchi illusion and "Rotating snakes". Doubling does not always give unstable perception. 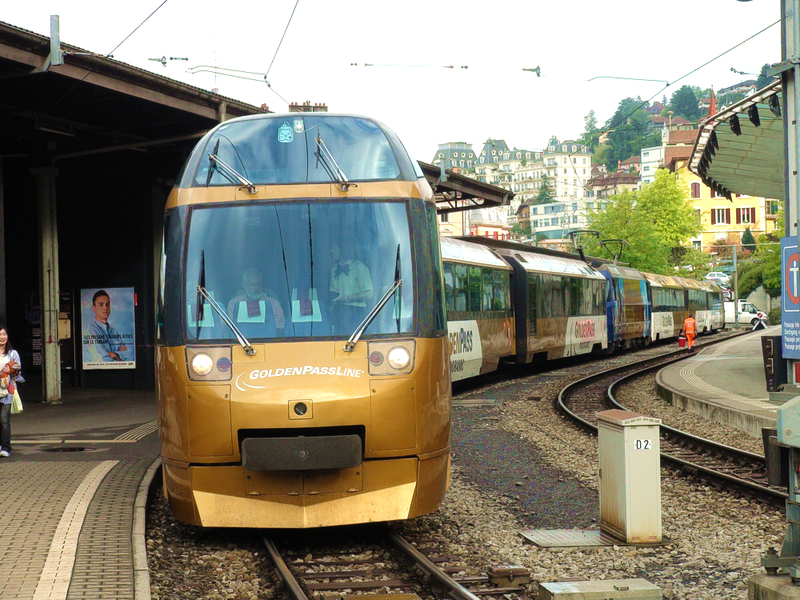 Doubling a potentially moving object gives a motion impression. Doubled tongues appear to swing. Acknowledgements: This study was supported by Grant-in-aid "Face perception and recognition: Multidisciplinary approaches to understanding face processing mechanism" awarded to Akiyoshi Kitaoka ("Discovery study of face illusions": No. 21119522) by the Ministry of Education, Culture, Sports, Science and Technology. 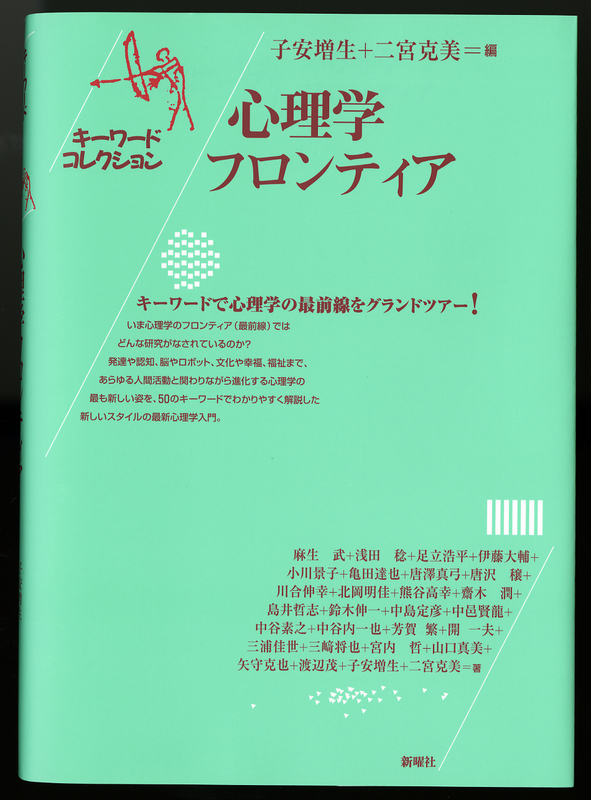 Morikawa sensei's question: The study of face perception has increasing activity from around 1980 when the Thatcher illusion was proposed. How do you expect the development in the near future (10 or 20 years later) of this study? (1) Most of studies of face perception or cognition use photograph-based images. 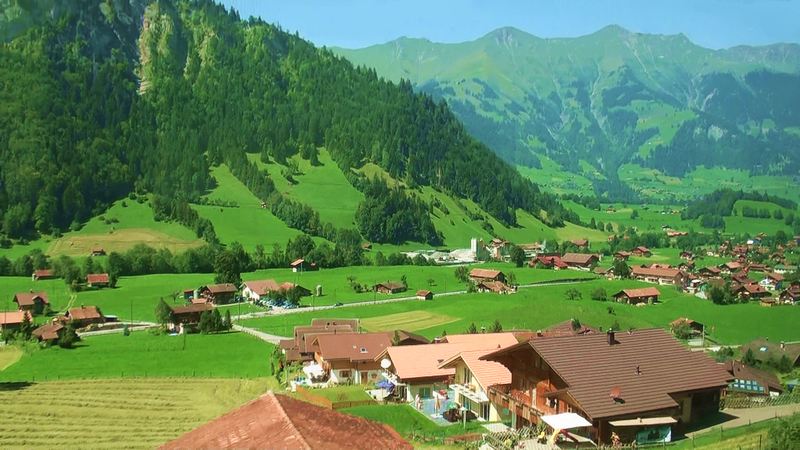 (2) I prefer computer-assisted graphic images, because e.g. mathematical control of Bézier curves (cubic curves with four control points) are available. (4) Innovation of technique (or craft) to directly draw low-spatial-frequency components of face images (e.g. Mooney face) is necessary, I think.